Owner, manager or marketer, you live and breathe what you do. You’re passionate about the service you deliver. You’re proud of what you do, and you want to promote it. But do you need help to market it properly? There’s so many options and channels you could use. How do you know what will make the most difference? Or where to start? How can you possibly be expert in so many things all at once? (writing, editing, design, ad placement, PR, event management, website updates, social media, database management, tracking and reporting… The list goes on! Online resources don’t help as much as you’d like. They tell you a lot about what you should do – what you could do. They even tell you how to do it. But they all say slightly different things. And you can’t tell what’s really important. What will make the difference. Plus, you’re spending so much time looking them up you don’t have any time to do the actual marketing! Training’s not the answer either. It’s great on the day. You get a clear picture of what to do and you’re all fired up. But a week later, when things don’t work quite the way they did in the classroom, you’re on your own trying to sort it all out. Someone who can advise, train and support you – not just once, but on an ongoing basis. Training on regular repeat tasks like updating your website, sending emails or reviewing analytics reports. With some documentation for when you can’t quite remember. Support for when circumstances change or you hit unexpected roadblocks. Looking at your marketing from an experienced, objective perspective, without being caught up in the day to day. Introduce best practices and tools to make your marketing more efficient and more effective. Developing a plan and framework so you keep moving forward, without getting bogged down or overloaded. No one knows your business like you do.If you’re considering a NoBull mentor, the first step is a no-obligation meeting. 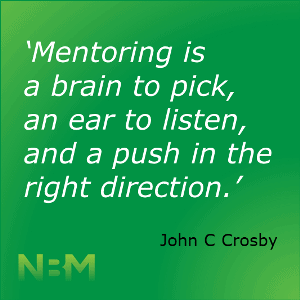 Mentoring requires a personal relationship – it’s important that you and your potential mentor can get on! So this meeting’s a bit of a trial run. Even if you choose not to go any further, you’ll probably end up with a couple of new insights you can use to help your business. So what have you got to lose?! Once you’ve met your mentor and decided to proceed, it’s time to get serious. We commit a full day of our time to initial meetings and research so we can get up to speed. In exchange, you commit to work with us for a minimum of 4 months – that’s time to see some real results. Initial half-day meeting where we work through a detailed process to review your current business situation, marketing history and status, key issues and objectives. After this meeting, we have a good idea of the current state of your marketing, plus top priorities to improve results in the future. Documented plan outlining key actions for next 4-6 months, prioritised and calendarised. Regular one-on-one meetings (face-to-face or by Skype, 60-90 minutes), to review progress to date and go over upcoming planned activities, addressing specific issues and knowledge gaps. We send minutes (and amended plans if necessary) after meetings. If you need them, we also provide additional training materials and resources. So you know what the next actions are – and you have all you need to do them. Unlimited ‘quick query’ support via phone and email between scheduled meetings. This can also include review of draft emails, flyers or web pages; referral to a specialist provider; or assistance with a minor technical or process issue. Further in-depth review meetings every 3-6 months. Exact schedule depends on how often you are meeting with your mentor. Every few months we also hold a social event, where you can meet and network with others in our business network. It’s an ideal opportunity to get more ideas, more perspectives and a big dose of motivation and support. Take your marketing and your business to the next level.